MELT 1 tablespoon butter in medium saucepan over medium heat. 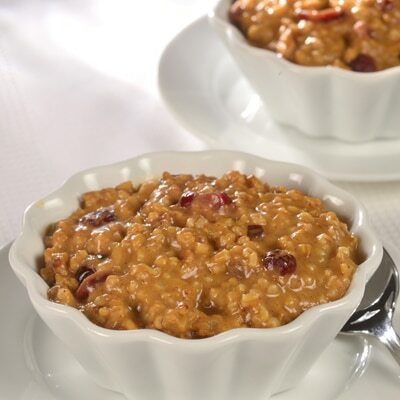 Stir in oats and continue heating, stirring frequently, for about 2 minutes or until oats smell toasted. Push oats up around side of pan and drop remaining tablespoon butter in center of pan; heat until melted. Add pumpkin to butter; stir with oats after 1 minute. Stir in brown sugar, cinnamon, ginger, salt, nutmeg and cloves and nutmeg into the pumpkin. Stir in water, evaporated milk and vanilla extract. Pour mixture into ungreased 1.5-quart casserole dish; cover. BAKE, covered, for 35 minutes. Remove from oven, carefully remove cover and stir in cranberries. The oatmeal mixture will be thin. Tent lid and let stand for 10 to 15 minutes before serving. The oatmeal will thicken as it sits. Serve warm with a drizzle of maple syrup.